The yearly reset button is upon us again, allowing you to change whatever you like. It’s an opportunity to reinvent ourselves but only if you have the strength to keep moving forward. It’s one thing to sit down and create a long list of New Year’s resolutions, and it’s another to have the will power or self-discipline to follow through with them. As the whole world is getting ready to welcome a new year, with dreams and hopes in their mind and soul, Celebrations happen in every timezone. it got me thinking of when did it all start? when did we start “new year and the celebrations?”. A few clicks on google and I learnt that the concept of new year or new years day goes all the way back to 153 B.C in Julius Caesar’s reign where he implemented the Julian Calendar where a mythical king called Janus was placed at the start of each new year (which is why the 1st month is named January). Janus has two faces, he could look back on past events and forward to the future. I can’t look into the future and nor would I want to, I feel whatever will be, will be. However I can reflect upon the past year of 2015 which despite my bad health, and many hospital stays I think it has been a brilliant year. I launched the purple heart challenge because st Valentine is also the patron st of Epilepsy. the unicorn inn did a music quiz for us. I received hundreds of photos from all round the globe with people with purple hearts on their arm. I went shopping at bluewater at the beginning of the year and at hempstead valley at the end, I had a lot of time in hospital over the summer however loved the summer i did get. Lloyds bank supported us and even did a sponsored cycle relay on a exercise bike in the bank! 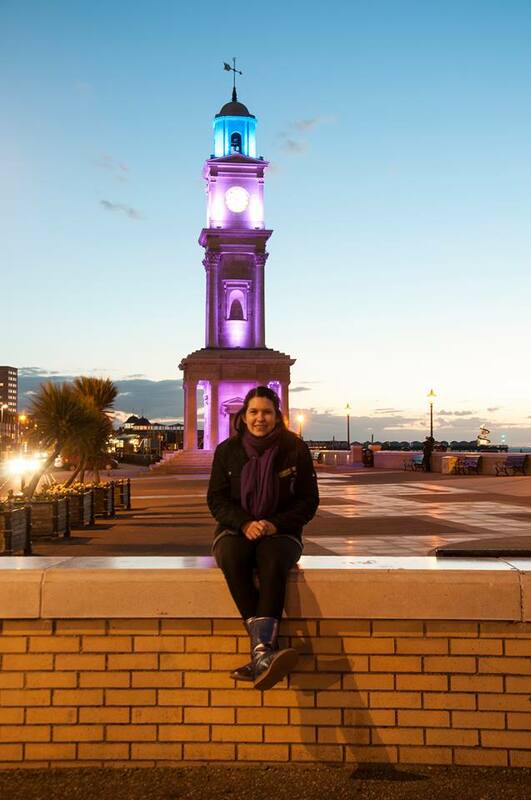 We shone a light in herne bay showing the world that we support epilepsy by turning the clocktower purple for Epilepsy awareness day, Herne bay clocktower stood among many prestigious buildings all over the globe. I went to the award ceremony to receive the Lord Mayors award in Canterbury. Leah had our team jo logo face painted on her head! We went to the herne bay airshow and also saw the last flight of the vulcan. A golf day was held by the Chestfield Rotary Club with the money being donated to us here at Team Jo to help with our goal. I had pre surgical testing and then the first part of my procedure and am now waiting upon what the next step will be. Although the date for New Year’s Day is not the same in every culture today, it is always a time for celebration and for customs to ensure good luck in the coming year. Making plans to change into a better person….known as new years resolutions. At times like this i think my situation has given me something special. Its given me the reality of life and I look at the world completely differently than someone of good health does. every morning I wake up in my own home, every moment, conversation, feeling, picture, days out of hospital or with less pain, not being on oxygen is precious. I dont know what’s going to happen in the next minute, hour, day – every seizure could result in me not being here so in reality I don’t know what the future holds. I value every part of what I have. Every friend, every hug, every kind word, and more. Yes the pain gets me down yes the seizures get me down that can’t be helped, I can’t change it – and for the present nor can anyone else. What does upset me is people going through life being rude, nasty and hurtful to others…One day you won’t be here and its only memories that will be left. Do you want peoples memories of you to be bad – “that woman always had a grudge” – “that man never had a good word about anyone” ? whatever lifes real meaning is, its precious and too short to go through it with the grumps. my resolution is to do more and go to more places with my friends and family – you only live once. Lets make 2016 another awesome year!